You can find a bunch of links from today's interview with NCompass Live's Michael Sauer, right here. Library Journal picked up my recent piece, "All Hat, No Cattle," which they subtitled: "A call for libraries to transform before it's too late." * librarians have to DO something, not just complain to each other. * the emerging publishing marketplace is way more interesting than just what the Big Six are up to. What a fun time to be a librarian! The Douglas County Libraries has many extraordinary staff members. Four of them are Colbe Galston, Elizabeth Kelsen Huber, Katherine Johnson, and Amy Long. They are all librarians. I'm very pleased to note their recent article, Community Reference: Making Libraries Indispensable in a New Way. It's in the latest (June, 2012) issue of American Libraries. Our library has been doing a lot of work on the cutting edge of our profession. This one - "Community Reference" - is important. It represents a shift from an internal to a more wholistic focus. Instead of asking what serves the library, we now ask how can the library serve the community? This may surprise some librarians, but it's not all about us. On the other hand, we have a host of skills that can not only make our whole environment (cultural, political, economic, etc.) better. This is also an opportunity for us to demonstrate our worth. Let me also acknowledge a profound intellectual debt. The mantra of my staff's article - show up, pay attention, stay (or keep) in touch - I swiped from my good friend and colleague Rick Ashton. Rick used to direct the Denver Public Library. These days he runs the Downer's Grove (IL) public library. His articulation of those principles -- maybe 15 years ago or more -- has been working on my awareness ever since. But hearing it and putting it into practice are not the same thing. It has taken me -- and my rising young professionals -- a little extra time to catch up to the vision. Thanks, Rick. You were WAY ahead of the curve. A couple of weeks ago, I turned on my System76 Meerkat NetTop (which I'd bought back in December of 2010 for $400) and heard the SNAP of some kind of electrical/power discharge. Dead. Although System76 is a great company, and the hardware seems generally reliable for most people (judging by online reviews), it marked the THIRD problem I'd had with my unit, and this one was out of warranty. Sometimes you get a lemon, no matter who the manufacturer is. So I unplugged and recycled it. The good news: I back up my home computer every week in several places. I didn't really lose anything but a few emails. At about that time, I got an electronic ad from the local Micro Center. So I wandered over, and picked up an Acer Aspire (5733/5733Z/5333 Series) series laptop for $300. Oddly enough, this morning I read an article by a librarian about why this is totally the wrong time to buy a laptop. Maybe ... if you really want the latest and greatest. The truth is, my needs are simple. My old Netbook is just a LITTLE too slow these days for me, and seems a tad underpowered for the modern software suites. But this new laptop just flies. It also has a big bright screen, and a comfy, well-laid out keyboard. I'm gearing up to write a book, and I wanted something that I could count on, and wouldn't get in my way. The new Acer came with some subset of Windows 7. It happens that Windows 7 isn't that bad. I slapped a couple of Open Source programs on it (the Chrome browser, the Abiword word processor, the Xmind mind mapper) and Notecase Pro (an outliner I use a lot and for which I have paid for a multi-platform license). Then I went over to the Ubuntu web site and downloaded the Windows Ubuntu installer (wubi for short). It's a program you run that lets you put Ubuntu on your Windows machine from inside Windows. Then you reboot, and choose one platform or the other. If you decide you don't like Ubuntu, you just uninstall it like any other Windows program. In some ways, it almost doesn't matter which platform I use these days: Windows, iOS, or Linux. I use pretty much the same tools on all of them, mostly open source. Ubuntu takes a little more time to set up than Linux Mint. Just search for "Ubuntu post-installation" to get the steps. Mainly, the issue is installing various codecs for media. It took about 45 minutes, mostly waiting for the commands to fetch and install things. Not hard, just a little tedious. It's worth it: Ubuntu also comes with so much good and free software that a little time is a reasonable trade-off. I've been spending most of my time in Ubuntu. I don't have to worry about viruses or Trojan Horses. It's speedy, attractive, and works well with my brain and work flow. And I like the fact that I can tote it around with me if I need to. Meanwhile, I have a compact set of data that I can move pretty much wherever and whenever I need it, all as reasonably well-protected (encrypted) as I can make it. Life in 2012, living on the edge of the cloud. - ownership. Libraries need physical possession of the file. - discounts. Libraries are volume purchasers, and as such, deserve discounts. - integration. With possession of the file, we can do a much better job of providing a simple, powerful and consistent user experience. - a Common Understanding (see the eVoke website, below), rather than complex contracts and licenses for each publisher, that spells out the terms of our business agreement. For instance, that we limit use to one at a time, using industry standard DRM, and that we'll buy extra copies of the file to meet the demands of simultaneous use (within budget constraints, of course). - a "click to buy" option for our patrons, to serve as a customer convenience, a demonstration of our value to publishers, and with the expectation that libraries share in the sale. So here's today's attempt to map out some sense of the possibilities. • Joining a "library consortium" means there is a common ILS, a content server, and integrated discovery and delivery. For many, this would mean an ILS change. • "Do it yourself" means you either outsource content hosting or not, but then customize discovery and delivery to your local catalog. It presumes a little in-house technical savvy. • "Library owned web service." This doesn’t exist. But suppose some regional (or national) library took an Adobe Content Server and Vufind (using the work already done by Douglas County Libraries, and as documented at the eVoke site at evoke.cvlsites.org), and delivered a separate service that allowed for a mix of consortial or independent collections – just leaving aside issues of ILS integration. This is a library-owned version of OverDrive. It might solve things for a lot of libraries, although the lack of integration isn’t good. • Vendors. The usual suspects, and more coming, I’m sure. At this moment, of course, NONE of them adheres to the principles above. What’s still missing is a common platform for purchasing and distribution. I think a shared Acquisition system, pre-populated with all the vendor information DCL and others have shared, would be a great collaborative library project. Likewise, a dedicated server for the distribution (sale) of ebooks both to libraries and patrons might have to be a library project, too. Both of these could and should be national. And of course, neither of the first three solutions can address providing content for the proprietary pre-Fire Kindle. Brilliant. 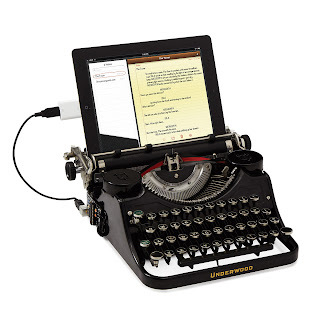 Available from Uncommon Goods for those people of a certain age who are simply looking for a familiar way to type stuff into an iPad.